So I had my wrist surgery about 2 weeks ago. I had to be at the hospital at 5am, but that was okay with me – at least it would be done and over with the first thing in the morning. They gave me a choice whether I wanted to be put to sleep or if I wanted the nerve block with IV sedation medicine. I don’t like being put to sleep, so I chose the other. I remember them getting ready to do my arm/nerve block and then the lady put that medicine in my IV. That stuff is absolutely awesome! The room started spinning and then I fell asleep for a while. Then I remember being wheeled into the OR and having to scoot myself over to the other bed, which I’m sure was comical to the nurses. My arm couldn’t move and I just remember smiling! The next time I woke up I was back in the recovery area with my mom. I remember the doctor coming in and telling me that everything went well and he didn’t have to do the more invasive surgery. He said that it was a big cyst and made a circle with his fingers to show how big it was – it looked to be about the size of a ping-pong ball…I woke up more and then they got me dressed and we were out of there. 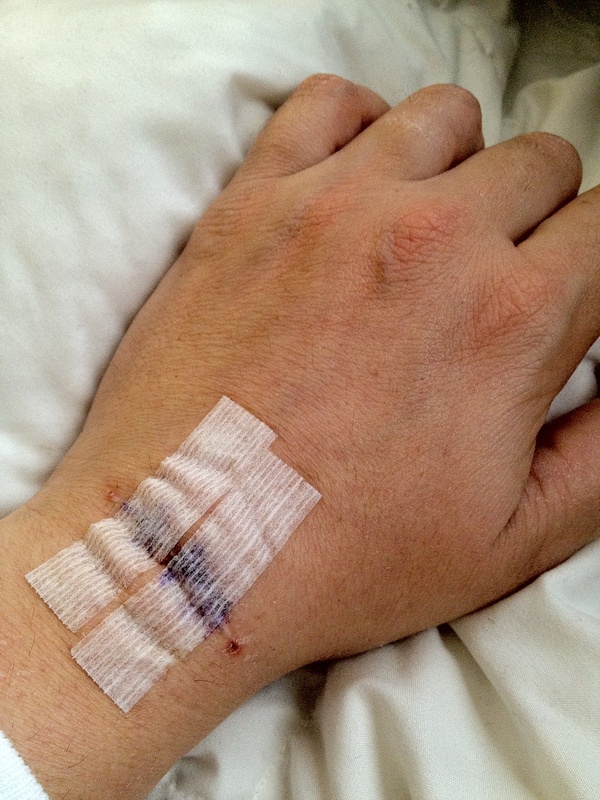 I was still groggy the day of the surgery and my arm stayed numb most of the day. I went to work the next day and was thinking that this recovery wouldn’t be that bad because I was hardly in any pain. But as a few days passed, it got more swollen and more sore. After a week the swelling finally started going down, but my hand was still numb up until my knuckles. Then my hand started feeling like it was burning all the time. Even if I just barely touched it, it would feel like it was on fire. Even the splint/cast constantly touching it would irritate it. I’m guessing it had something to do with the nerves. I had my checkup appointment yesterday and they took off the splint/wrap. It felt so much better but I don’t like having it not protected. They took out the stitches and said it looked good. There are two pieces of tape over my wrist that should come off in the week. The doctor said that he went all the way down to where the ligaments are in the joint and tried to get every piece of it out, and then cauterized everything down there. He said that the nerves he was trying to work around were about double the width of a strand of hair, and that they probably just got irritated while he was trying to move them around (which is what is causing the burning). I still can’t bend my wrist down, but that will get better over time. I just hope it doesn’t come back again!